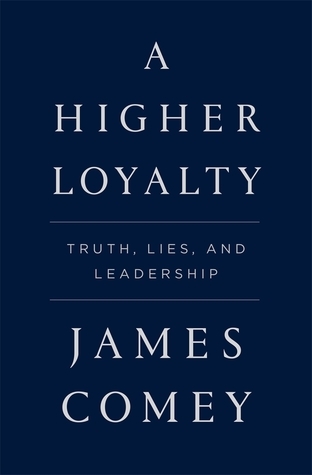 This entry was posted on Saturday, May 12, 2018 and is filed under A Higher Loyalty,Book Review,Donald Trump,James Comey,Memoir,Nonfiction,Politics. You can follow any responses to this entry through the RSS 2.0. You can leave a response. *shivers* I am quite sure what he said is true. Good to know most of what was written has already been disclosed. Great review Ethan. That seems to be the pattern with these books. They release little blurbs that end up being the most interesting parts of the book. "We can't seem to get enough of him"
Yeahhh, no, I've had quite enough. I contemplated reading this, but decided to hold off for awhile. I've heard him in interviews, but would definitely like to get more depth to his story. I was definitely surprised to read about the extent of Comey's career as a public servant. I've got to agree. Whatever your opinions on the president, he is so famous and well known for just being him and doing whatever he wants xD I hadn't heard of this book but it sounds interesting to have an inside perspective, and to see whether or not you end up agreeing or disagreeing with him and his choices. We can’t seem to get enough of him in our news. This was a refreshingly different take.